Over the course of their 30-year journey from Magoo’s Pizza Parlor to Soldier Field, the Grateful Dead played in hundred of places of every size and description—race tracks and movie palaces; bars and ballrooms; college gyms and concert halls; venues great and small, famous and obscure. And the scene of the performance documented in this releases was about as far as you could go on the “obscure” end of the spectrum: a venue about which little is known, despite its location in the heart of one of the more bustling entertainment districts on Earth, Hollywood’s Sunset Strip. Even basic facts like the name and address of the place have remained the subject of some confusion. Since the great three-night stand the Dead played there in December of 1969 seems to be the most famous thing about the room, it’s long been assumed it was called “The Thelma Theater,” probably because that’s the way the name has appeared on the lists of shows passed around for decades among Dead Head tape traders. But the facts suggest that it was not a theater at all but more of a lounge, and a tiny one at that, judging by the small audience size indicated in this recording. The handful of print ads that exist for what seems to have been a short-lived business reveal that it was called simply “Thelma”--perhaps in keeping with the jocular names some venues chose back then, like the popular New York discotheque Arthur (named after what George Harrison said his haircut was called in A Hard Day’s Night). Maybe it was christened in homage to the late Hollywood screen siren Thelma Todd, or the veteran character actress Thelma Ritter. Or was Thelma really the name of the person who ran the joint? On this recording, we do hear Phil Lesh say between songs “OK, Thelma, time to turn down the heat now.” But the rest of the band’s onstage banter is, as ever, so full of jokey misdirection that we can’t really know if Phil was speaking to an actual Thelma or just using the club’s name to address the management. Thelma was located at 8917 Sunset Boulevard, although one of its print ads confused historians by erroneously listing the address as 8849 Sunset (perhaps an object lesson in the perils of stoned typesetting--not an uncommon occurrence in the heyday of the underground press). In earlier incarnations, the space had been a Hungarian restaurant called The Little Gypsy (at which, we’re told, Judy Garland once celebrated a birthday in the 1950s--ah, the random joys of Internet research! ), then an upscale restaurant/lounge called The Golden Violin, whose owner, sensing the cultural sea change along the Strip in the mid-’60s, turned it into a rock club, the Galaxy. It stood in the middle of a block that was crammed with music venues and hangouts. On the corner to the east was the most famous of them all, the Whisky a Go Go; to the west was the place to go for a late-night bite, Hamburger Hamlet; the restaurant/jazz club Sneeky Pete’s was nearby; and right next door was the London Fog, where The Doors in their formative stages had a residency, before Jim Morrison’s misbehavior got them fired and the Whiskey grabbed them to the house band. The Galaxy had a fledgling house band of its own, soon to become famous as Iron Butterfly. Nightlife on the Sunset Strip took a hit following the 1966 riots touched off by an LAPD curfew crackdown, and many of the clubs in the area changed management, stopped hosting live music, or closed outright. By the time Thelma took over the Galaxy space in the fall of 1969, the Strip’s glory days were long gone. Exactly how long Thelma stayed in business is hard to discern as are the details of its seemingly hit-and-miss booking history. Some acts featured in a print ad heralding the club’s impending opening that November disappeared without explanation from subsequent ads, and it seems that promised engagements by local heavy hitters like The Byrds and Steppenwolf did not happen, although shows by Poco, Al Kooper, and the Ike & Tina Turner Revue may have come off. LIke everything else about the place, the historical particulars are lost in the mists of time and flawed memory. But about this much, at least, there is no mystery: the Grateful Dead definitely came to Los Angeles in December of 1969 and definitely played three nights at Thelma. Did they ever! As this recording of the engagement’s final show gloriously demonstrates, this was a band riding a monster wave of creative energy, in the midst of a stunning period of musical reinvention. A little over a year earlier, the Dead had been in nowhere near as promising a position: internal tensions had damn near puled the band apart, and they were deep in debt to their record company, due largely to the massive amount of studio time racked up on their unwieldy 1968 masterpiece Anthem of the Sun. But the Dead resolved to right the ship and--entirely counter to their perverse and quixotic nature--maybe try to do things a little more simply. They began 1969 with this new agenda in place, as characterized by two recording projects. The first was a new studio album that would be considerably less cumbersome and costly than Anthem--although hardly the stuff that career-saving chartbusters were made of (the music was still plenty weird, and the title--Aoxomoxoa--not exactly calculated to roll trippingly off a disc jockey’s tongue); the second part of the plan was to record, as economically as they could, an album that would distill on two long-playing records the essence of the Dead’s long and already legendary live performances. In this endeavor they succeeded brilliantly. Live/Dead remains one of the most highly regarded live albums of all time and an essential introduction to the band’s music. Something else very significant happened in the Grateful Dead’s creative life in 1969: Even as the band’s live performances continued to display much of the psychedelic fire-and-brimstone of their most wildly experimental and anarchic period, the Dead made an utterly unexpected turn toward country, folk, and other American musical traditions. 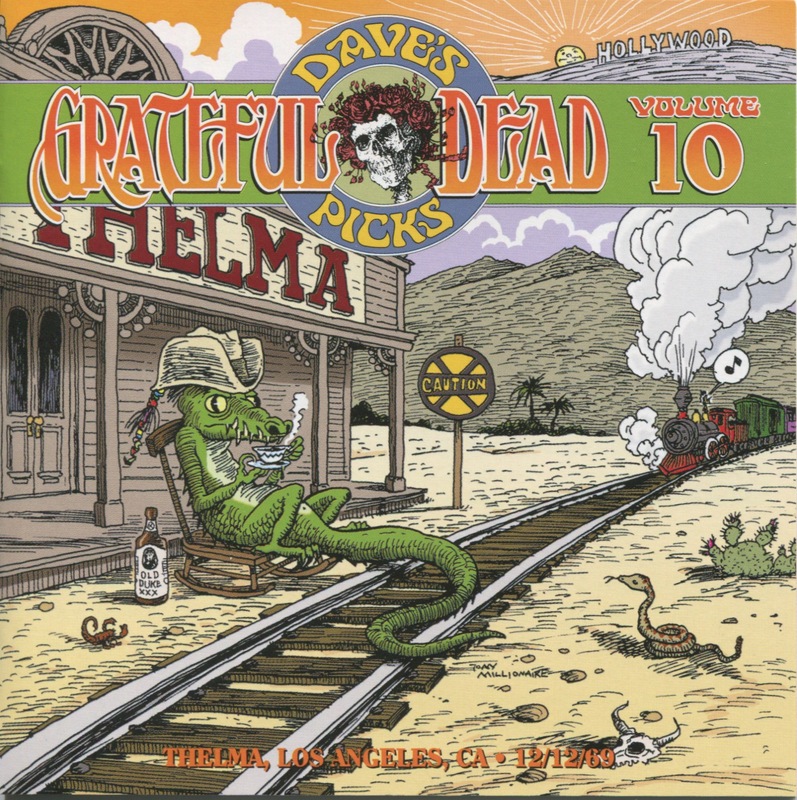 Jerry Garcia introduced the sweet sound of the pedal steel guitar to the Dead’s palette, and the band began covering songs by giants of country such as Merle Haggard, George Jones, and others. More significantly, these influences were manifested in the Dead’s original compositions, particularly those by the rapidly maturing Garcia/Hunter songwriting duo. By year’s end, they’d written and given live debuts to the songs that would make up Workingman’s Dead, the album that forever changed the course of the band’s career upon its release the following spring. By the time they got to Thelma in December, the Dead already had under their collective belt 135 of the career-high 147 gigs they could tally in 1969. Live/Dead had been released to enormous acclaim just weeks earlier, which likely contributed to the band’s high spirits as they settled into that little room for the three-show run, the last night of which is presented here as recorded on the original soundboard tapes. (The first reel, by the way, went missing from the Grateful Dead vault for many years, only to be recovered decades later in a precious stash of prime stuff from the era.) What you’ll experience of this recording is a near-perfect encapsulation of the 1969 Grateful Dead, their musical past, present, and future somehow miraculously reconciled. Seven of the eight songs that would appear on Workingman’s are heard, as well as generous hunks of material from the band’s earlier repertoire, traditional covers, and, as ever, wild bursts of improvisational abandon. Thelma, we hardly knew you. But thanks for the use of the room. This album was released in May 2014.